Puget Sound Sage advocates for a strong carbon pricing policy that re-invests revenue from a carbon-pricing mechanism (whether it be a cap and trade or a carbon tax) into targeted communities that need it the most. A cap and trade or a carbon tax offer both upsides and downsides for the environment and equity, which you can learn more about here. In Sage’s opinion, the merits of each policy comes down to how well it is implemented and whether or not there is a targeted approach to supporting people of color and people with lower incomes. We looked towards California’s policy SB 535 – which first commissioned a study to understand environmental hotspots in California. Based on the findings it then had community and policy experts work together to reinvest 25% of the revenue into smart investments that simultaneously address poverty and environmental challenges. This policy has resulted in the largest investment in environmental justice communities in the country. California has already moved millions of dollars to create green jobs, build affordable housing, build up transit centers and invest in clean trucks (which is vital for the health of communities living along heavily polluted truck routes). How do we evaluate any carbon pricing policy? 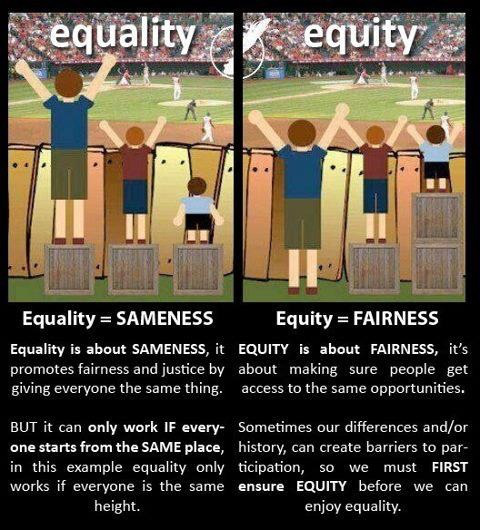 We start with equity and look towards investing in communities with the most need – but we should be clear about what equity means. This chart can be helpful to explain the difference. Does Carbon WA’s proposal meet the equity measure? Carbon WA’s proposal is to tax carbon and use the revenues to 1) reduce the sales tax by 1%, 2) give tax breaks to specific industries, and 3) put the rest towards funding a working families tax rebate. On the surface, this seems like good policy. But let’s examine their approach through a social justice lens. Ultimately, the core concept to Carbon WA’s carbon tax proposal is “revenue neutrality,” where we greatly increase tax on one thing (carbon) but reduce taxes on other things (general sales). The problem with this is what the revenue neutral approach is about giving everyone the same via a tax reduction. Even at a 1% lower sales tax, this policy solution does not address the severe regressivity of our state’s tax policy – people with lower income pay more in taxes in Washington than any state in the country. To their credit, Carbon WA included a portion of the revenue to the Working Families Tax Rebate a good policy similar to the Earned Income Tax Credit that gives working families larger refunds at tax return time. However, this solution does not take into account the fact that some communities live in closer proximity to environmental degradation and thus bear worse consequences. In addition, it leaves out large swaths of people with low incomes: specifically, people who lack documents to work in this country, single people, and people on fixed incomes. For the future of our planet and for the people already experiencing the consequences of climate change, any policy must reduce carbon pollution. A successful and socially just policy will include revenue investments that create good jobs, prepare our region for climate change and incorporate the needs and input of communities of color and communities with lower incomes. We believe Carbon WA’s revenue neutral approach falls short of this measure. Categories: Environmental Justice, Public Health, Racial Justice, Sustainable Communities, Uncategorized | Permalink. Income inequality is a growing problem in Seattle. Many of us don’t need statistics to tell us that, because we can feel it and see it happening. However, it helps to quantify a problem in order to address it. Just over a week ago, I attended the annual Regional Leadership Conference sponsored by the Seattle Metro Chamber of Commerce, courtesy of the Bullitt Foundation. The conference featured a report by the Boston Consulting Group (BCG) on Seattle’s global competitiveness. Their report highlighted growing income inequality as a key issue affecting the region. BCG compared Seattle to eight global competitors, including San Francisco, Boston, Singapore, Amsterdam, and Hamburg, using almost 50 different economic and social indicators. Overall, Seattle was right in the middle of the rankings. They also pointed out Seattle’s growing economic inequality as measured by the Gini Index (a measure of income distribution). BCG predicted that in the next 20 years Seattle will pass New York City in inequality. Why? Middle class jobs have been disappearing in our region, leaving a big gap between top income earners and low-wage jobs. But something important was missing from the discussion: BCG did not suggest raising the standards for low-wage industries to create more middle income jobs, but focused instead on bringing employers that offer middle class jobs to the Seattle area. Workforce standards play a vital role in creating living wage jobs. This is an especially prescient issue given the near strike of grocery workers in Seattle this week, the uprising of food service workers throughout the city and the presence on the ballot of Proposition 1 – the Good Jobs Initiative – in SeaTac. It is short-sighted to neglect workforce standards. 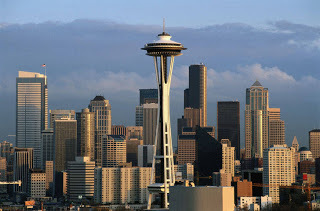 Washington’s Employment Security Department projects that the fastest growing industry in the Seattle area from 2011 to 2021 will be the Employment Services sector, which is principally temporary and contract jobs. Half of all projected jobs by 2021 will be in low-wage occupations like retail sales, food preparation, and janitorial services. According to BCG, transportation infrastructure and the education system are Seattle’s biggest competitive disadvantages, with the worst scores for traffic congestion, transit utilization, and some education measures. BCG’s John Wenstrup noted that South Lake Union already is suffering from heavy traffic congestion, with three million square feet of additional office space still to come, (not to mention the Hedreen mega-hotel development right down the street at 9th and Stewart). Several conference speakers also noted that Washington’s education system is struggling to train workers for the good jobs of the future and reduce high school drop-out rates. Let’s juxtapose those facts against this: BCG concludes the costs of doing business in Seattle are among the lowest of the global cities—Seattle’s average wages are third lowest out of the nine cities, at a average of $21.00 an hour, and office and industrial rents are lower than average. Of interest to the debate over living wages at SeaTac: Delta Airlines Vice President Mike Medeiros told the conference that Delta is expanding in Seattle, in part because international routes from Sea-Tac Airport to Asia are shorter than flying from San Francisco or Los Angeles, meaning Sea-Tac will continue to grow as an international airline hub. What we need to remember is this: Living wage jobs and higher workforce standards need to be at the center of our attempts to address economic inequality in the region if we are to make a significant impact on our regional competitiveness. Categories: Affordable Housing, Community Benefits and Development, Environmental Justice, Equitable Transit Oriented Development, Health Insurance Coverage, Living Wage Jobs, Port Jobs, Public Health, Racial Justice, SeaTac Proposition 1, Sustainable Communities | Permalink. King County Metro is planning for a 17% reduction in bus services beginning in 2014 during a time when ridership is at its highest point since `08. Unless state lawmakers take up transit funding during the upcoming special session in November transit riders can expect cuts to 600,000 service hours, 65 routes eliminated, and 86 routes reduced or altered. That will mean longer walks to stops, longer waits, more difficult transfers, and more crowded rides. To some, it will mean total loss of public transit options. To find out the details about what routes are at risk, visit King County Metro online. Transit riders and city residents will have an opportunity on Monday October 14th to make their concerns heard when State Senators will be making a stop on their “listening tour” in Seattle at First Presbyterian Church. The Transit Riders Union is planning a rally outside the church beginning at 5pm. Transit riders who have a car are likely to go back to driving, adding between 20,000 to 30,000 vehicles (according to the office of County Councilmember Larry Phillips) to already congested traffic conditions in Seattle. Not only will commutes become more hectic, but the city’s environmental goals for transit will be undermined. For those who rely on public transit – most likely to be people of color and low wage workers – service cuts represent more than an inconvenience. A disruption of transit at this scale can be detrimental to those for whom public transit is their primary source of transportation to get to jobs, schools, daycares, and grocery stores. For more information about the cuts visit KIng County Metro online. Categories: Community Benefits and Development, Environmental Justice, Equitable Transit Oriented Development, Racial Justice, Sustainable Communities, Uncategorized | Permalink.